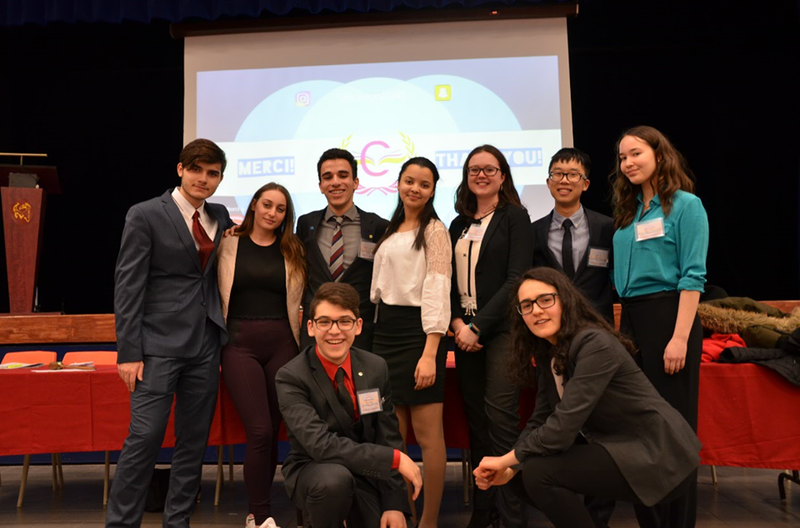 On March 17-18, 2018, delegates gathered at College Charlemagne in the West Island of Montreal to participate in the school’s first ever Model UN conference. Despite this being the conference’s first year, feedback from all participants was overwhelmingly positive. Delegates in SOCHUM fought for equitable access to education all around the world, and later tried to overthrow the Dictatorial Republic of Africa in a social crisis. In the OAS committee, delegates tried to resolve the crisis in Venezuela, and then entered a crisis where they were faced with drug cartels in Latin America as well as indigenous rights. Thankfully, Harry Potter magically appeared in the committee to solve the cartel problem. As for NATO, delegates tightened the security around the organization’s interdependent framework, then had to face a crisis regarding Russian expansion and aggression. After having the United States unceremoniously leave the committee it was a founding member of, Zimbabwe decided to declare war on Greece, almost starting World War III. Finally, delegates in the Harry Potter used their collective imaginations to come up with the most creative solutions as to how to free Hogwarts from Voldemort’s Death Eaters. They even came up with their own spells, such as one cursing the recipient with minor inconveniences, such as kettle corn permanently stuck in their teeth. The entire Secretariat would like to say a huge thank you to all delegates who participated as well as staff and volunteers who helped make CCIMUN’s inaugural edition such a success. We hope you enjoyed your weekend and hope to see you next year! 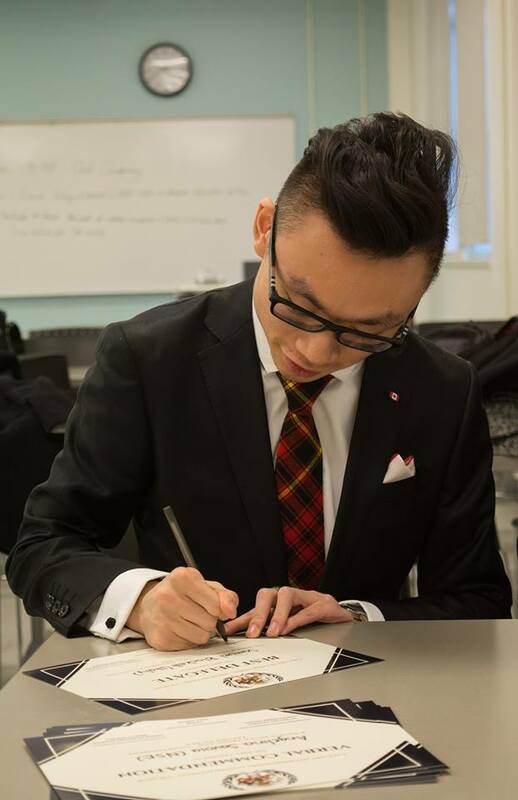 On February 3rd-4th, over a hundred and twenty delegates gathered at the University of Calgary for CICMUN's inaugural year. Despite some crises (pun-intended) for the staff and secretariat, the conference was on overwhelming success, as many delegates had a fantastically fun time and an enriching educational experience. In The European Winter Crisis of the 1980’s - a Joint Crisis between the Mafia and the INTERPOL, we saw Pandora’s box open up. With the incursion of the Yakuza, the kidnapping of John Lennon and Michael Jackson, and weapons and illicit substances being traded all around the world, these committees truly had an eventful weekend. In The League of Nations in the 1930’s - our historical crisis committee - we saw the invasion of Abyssinia, the rise of Adolf Hitler, the expansion of the Empire of Japan and the eventual collapse of the League. With the rise of a communist Italy, the Pope’s escape to Brazil and the Holy Army's conquest against the United States, and the continued survival of fascism leading to a three-way World War: these crises ultimately proved too much for the League and ended with its demise. In a World in Nuclear Fallout 2100 - our 'future crisis' committee, where after the third world war began in the 1980’s the world faced a host of issues. All sorts of radiation needed to be cleaned, with trade routes needing to be re-established, new conventions and laws being drawn. Eventually the rise of zombies and rabid beasts, and the surviving scientologists creating an army of super soldiers threatening to wipe out the planet’s governments, the first world congress aimed to create time travelling devices and invaded the Suez Canal twice (unsuccessfully). The arrival of the aliens meant the unification of humanity, and a united front for the committee in the end. Lastly, we have the International Court of Justice which was an ad hoc committee. This year the ICJ discussed the certain questions regarding the alleged creation of Al Qaeda by the Central Intelligence Agency. We saw President George W. Bush’s arrest, Rex Tillerson attempting to murder Bill Clinton, Bill Clinton standing trial, and the rise of many covert operatives known simply as Jason Smith. Despite the many intricacies and confusion of conflicting testimonies and biased evidence, the delegates were able to decipher the evidence before them and come to a conclusion - wherein they found Bill Clinton guilty. Monish Ahluwalia, my Co-President and the Director General of MacMUN 2018, and I are beyond excited about the success of the conference this year. It was truly an amazing experience for both the secretariat, and the delegates alike. MacMUN is an innovative conference and we cannot wait to see what the future of the conference holds. I would like to invite you all to attend MacMUN 2019, as it is a MUN experience like no other. It is beautifully recapped below by our executive, Gursharan Sohi, below. McMaster University’s Model United Nations organization recently held its third annual MacMUN conference from February 1st to 4th, 2018. Students from across Southern Ontario gathered in downtown Hamilton, adopting the roles of international diplomats interested in addressing the challenges of the global community. The conference opened with remarks from Ms. Hoojung Jones regarding the humanitarian atrocities implicated in the Korean War. Her words reminded us all about the impactful nature of our actions both throughout the weekend and beyond Model UN. Recognizing that McMaster is situated upon the traditional territory of the Haudenosaunee Confederacy and the Anishinaabe Nations and in light of recent events regarding Aboriginal issues, this year’s theme of “Cultural Reconciliation” was selected. Although represented throughout all nine committees at the conference, this theme was perhaps best embodied by the spirited discussions in the Permanent Forum on Indigenous Issues committee. However, the range of topics discussed at MacMUN’18 was extremely diverse, spanning both time and space. Several highlights included cyber warfare in the UN High Commission on Technology, immigrant integration in the Economic and Social committee and even troop movements during the 1960’s Vietnam War in our historical crisis committee! One of MacMUN’s most exciting features has always been the integration of social media and technology to enhance the delegate experience, and this year was no exception. The media team worked tirelessly all weekend to ensure that video content, MacMUN News Channel updates, and the use of Twitter connected delegates across the various committees and gave them an experience unique from any other conference. Friday night saw our first social event held at 1280 Bar + Grill on campus; this event provided an opportunity for students to forge new friendships with one another in a casual setting following the intense debate of that day! The next evening, we held our annual Club Night which was undoubtedly an enjoyable experience for all. Throughout the weekend, delegates worked extremely hard to create equitable solutions to complex global issues. Each individual should have left the conference feeling a sense of pride in what they had accomplished. The cooperative and innovative resolutions proposed are a hopeful reflection of what these future leaders will one day achieve! Additionally, the success of the conference would have been impossible without the hard work of dozens of staff members who moderated debate as Chairs, created chaos in Crisis, or captured every vital moment as a part of the Media team. Their months of dedication and enthusiasm definitely paid off as delegates left the conference with smiles on their faces (and some with awards in their hands)! Our guest speaker at the closing Gala was Mr. James Knibb-Lamouche, who praised our work so far and challenged us to accomplish even more in regards to achieving peace and equity in the future. MacMUN’19 will surely strive to accomplish these goals next year, and we cannot wait to see you there! The largest Western Canada collegiate conference held its 26th annual conference in downtown Vancouver on January 5-7th, 2018. With the theme of “Complex Problems, Creative Solutions” our delegates were poised to be tackle problems with new ideas more than ever before. Our conference had five committees, including the General Assembly Second Committee, Security Council, Commission on Science and Technology for Development, International Court of Justice, and the International Press Corps. Delegates from the United States and Western Canada joined us this year, with a total of about 140 delegates. Dr. Jenny Peterson of the University of British Columbia helped set the tone with a thought-provoking introductory speech on new ways to tackle wicked problems in International Relations. Asking the delegates at the opening ceremonies to do an exercise where they discussed world problems that they felt particularly poignant, delegates were already beginning the process of working closely together. Over the next three days, delegates discussed topics ranging from the Food Security, The Situation in Myanmar, and simulated the Jadhav India v. Pakistan case in the ICJ. Our unique International Press Corps represented news outlets from all over the globe, reporting on the events and discussions of the United Nations and publishing up-to-date articles. One of the most popular parts of UBCMUN, the Press Conference on the second day gave delegates from every committee the opportunity to hear about the proceedings of other committees, and witness some delegates be questioned about their actions by the press. Our Saturday night out at Republic nightclub was one of the most popular delegate socials we have had to date, and we look forward to improving it even more going forward. Throughout the conference, delegates pushed the topics to their fullest potential, seeking the most comprehensive and cohesive solution in all cases. Our staff and secretariat worked hard to ensure a smooth conference, and throughout the weekend, we witnessed some amazing work by the delegates and each other that confirmed our vision had been met. All of delegates were so strong this year that staff members asked to add awards in the last minutes because choosing the top candidates was too hard, a display of the true quality of debate this year. Our best delegation award went to the University of Calgary.